After an amazing two weeks with Kristy and Kasja, it was time to head back to Wisconsin. We had so much fun, shopping, sewing, spending time with my daughter and a Kasja (14mos) and a very independent mini version of her Mother Kristy. Mom's prayers do work "Someday you will have a child just like you." Kristy was smart, way ahead of schedule, and very independent and so is Miss Kasja. It is amazing to see her with her daughter. I am so proud of the person she has become and the mother she is to her daughter. Kristy and Kasja, we will miss you! (I know you reading this). We will see you in July when we take a long weekend to be there to see the new baby arrive. Use the $1 Dove Face Care mfg. coupon from the 5/17RP. Final Cost $.25 cents after coupon! Coupon is Good on the Text & Learn, My Pal Scout, Scribble & Write, and the Alphabet Explorer. Check out the Demos on these new items. I wish I had the coupon last week when I bought the Text & Learn at ToysRUs when they had it on sale. Head on over to Target to pick up select Disney/Pixar Movies for $13.99 and Get one FREE voucher (up to a $7.50 value) to Disney/Pixar’s new theatrical movie, UP, at participating theaters with purchase of any of the Disney/Pixar DVDs. To Get your movie ticket you use the in-pack code on line. Follow the instrucions on the sticker for details. Make sure that the movie you pick has the Free Movie Ticket Sticker in order to get the UP Voucher. Included on the Ad: Finding Nemo, Cars, Ratiquoille, WallE, The Incredibles. Don't forget you can get a $5.00 Disney/Rayovac movie rebate for buying any Disney Movie plus 2 packages of Rayovac batteries. **Use $1.00 AA two battery pack packages found in the Dollar Bin Section at the front of Target to fulfill the rebate requirements. This Rebate good thru 6/30. Pay $10.99 for Movie and Batteries and $7.50 Disney Movie UP Voucher. Don't forget to head on over to Disney Movie Rewards and enter your points to earn Disney gear or save for more Free Movie Tickets. Kristy and I had run out to pick up Sunscreen and score some really inexpensive sunscreen at Walgreens. This morning I was checking my favorites and found Coupon Cravings had posted even more high value sunscreen coupons. We are stocking up for the summer with both of us now being pool owners. 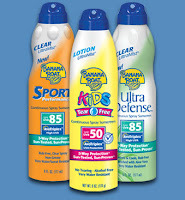 Banana Boat is on sale buy-one-get-one-free at Walgreens through Saturday. Use Two Hawaiian Tropic Coupons along with Walgreens BOGF (look for the bonus packs that have bonus body butter and lip balm). Check out my post on this deal. Becca and Kasja who loves driving. Whole Foods huge selection of Wow Baking Company. We bought the Snickerdoodles, Oregon Oatmeal, and Brownies, they are amazing. 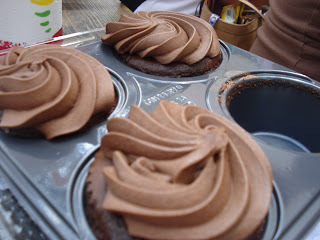 We indulged on not so frugal amazing Cupcakes. Life is too short and so is vacation to not indulge. At $8.99 for four cupcakes, good thing I save money on everything else but our Gluten-free Goodies. For us, this is a treat! Whole Foods is not close to our home, the nearest store is almost 90 miles away in Madison. 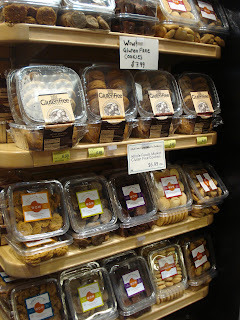 The Austin Whole Foods is an adventure and our new favorite place to stop for to pick up a few Gluten-Free groceries and a snack when we visit. The Wow Baking Company has on line sales and will soon be selling the prebaked cookie packages. They also have cookie dough tubs. All their products are Certified Gluten-Free. My mission when I get back... Get our Platteville Driftless Market to become a retail outlet or I will order on-line. With school getting out and pool season opening, it will be a good time to stock up on Teen Junk Food Snackings when the girls have friends over swimming and watching movies. Keebler Fudge Shoppe Cookies (11.5 oz) - $2.33 each. Remember to print off your $1.00 Bliss Coupons to pick up a free candy bar with each transaction. *I use family members for my transactions when I can so I will not get the stares of the cashiers or create line rage especially when we go on Saturday. Courteous Couponing helps break down the barriers of coupon discrimination we all sometimes face. Remember to friendliness goes along way with the cashiers or management. Remember to carry your coupon policy with you and the Corporate phone numbers in case friendliness and printed policies do not work. We headed off to Target for baby hangers (Kristy wanted to get Mahala's closet together) and found a few bargain match-ups. I now have 10 Deodorants to Donate to the Ladies for their Veteran's Tote Bags. I had run through the line for Kristy and got her the edge and candy bars, as did Becca. We will beat Targets one Target coupon of a kind per transaction for some inexpensive items for her pantry. Repeat of #1 and #2 As I have multiple Reach Coupons and Will print two sets of Hawiian Tropic Coupons. *Note the Hawaiian Tropic Sunscreen will only let you print two, use two different computers to get enough coupons to do this deal multiple times. I get home from Texas late Friday Night and will have to head out to Walgreens Saturday morning and pick up the toothbrushes for the VFW Ladies in town who make totes for the Veterans at the VA Home and Hospitals. They collect razors, shaving cream, toothpaste, deodorant etc. and with couponing often times I can get these for little to free. In this case I am picking up the toothbrushes giving me Rapid Rewards to use instead of cash, and helping others in the process. I am glad I had not picked up sunscreen yet, we go through a lot of sunscreen as our backyard pool is our favorite money saving hangout for the summer months. Now only if I can find some coupons on saving money on the chlorine tablets! The pool guys will be there on Thursday to open the pool and by Saturday we will be swimming. 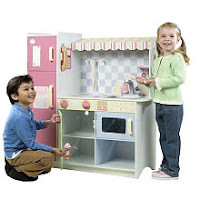 ToysRUs has their Just Like Home All in One Wood Kitchen on sale for $49.99 ($99.99 Reg.) for the Holiday Weekend. Starting May 22nd and running through May 25th, SAVE $5 INSTANTLY when you buy any 2 Mega or Jumbo Packs of HUGGIES Diapers, PULL-UPS, or Goodnites. Hurry in, this offer is only good 5/22/09 - 5/25/09. Pull out those High Value Coupons that have been out lately and stock up on some inexpensive diapers. 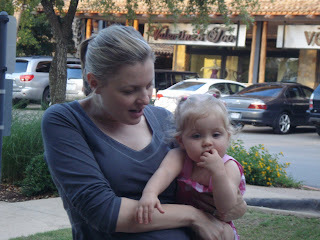 Kristy, Kasja, Becca and I will be heading to BabiesRUs and buying diapers for Miss Kasja and the new baby due in July. Tuesday Morning On Line has Pet Gear for the Traveling Dog. Becca bought these today for Little Morgan. 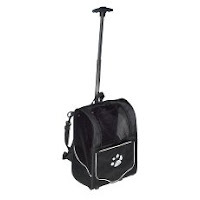 Pet Gear is a roller bag, backpack, carseat, and tote all in one! It’s designed and developed for the utmost convenience and comfort and approved by most airlines for travel. Suitable for pets up to 15 lbs. 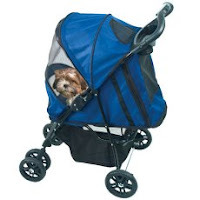 Take your pet anywhere in this cobalt blue Happy Trails Pet Stroller by Pet Gear! It safely contains and protects your pet wherever you go. The durable nylon carrier features zip entry and mesh panels for easy in and out and breathability. Suitable for pets up to 30 lbs. Shipping Ran $25.00 but well worth finding the items reduced. It solves our problem that she cannot carry her bag without tiring. (Dog is 5 pounds and cases are heavy causing fatigue). She will definitely be one pampered service dog who does not even have to walk to be of service :) We learned that Morgan travels well, but I get to carry her in her case through the airport. Now Becca can be independent. I also learned that the airline does not charge for Morgans Luggage or supplies. I wonder if the airlines has ever had a Dog Stroller checked at the gate? Little Morgan impressed me and the airlines with her "perfect behavior" on her trip to Texas, lets hope she behaves that well on the way home. Fourth of July Special at Shop World Kitchen and get $1.99 Cobalt Blue Pyrex. On Sale: 3 Quart Oblong Cobalt Blue Baking Dish and the 1 1/2 Quart Cobalt Blue Loaf Pan for $1.99 each. The pie plate is already sold out at $1.99. They also have the 6 ounce matching Custard Cups for $.50 each. When I placed my order I signed up for their email and got an automatic 20% off my order coupon code which was automatically taken off my order ($2.59). I got 1 3-qt. oblong baking dish + 4 loaf pans + 6 custard cups for $12.97 less $2.58 (20%) off plus $6.95 shipping for a TOTAL of $17.88. I don't think I could find pyrex loaf pans at a garage sale for this little. I have been making alot of gluten free breads of late and only had one glass loaf pan. I found this deal on Deal Seeking Mom. For one day only Old Navy has their solid color flip flops for One Dollar a pair. Limit 5. Yesterday I managed to find my way to find Old Navy here in Texas to pick up Becca a $10 bathing suit and now that I know how to get there from Kristy's Becca and I may have to venture out to pick up some for us girls. Becca had wanted the pair that matches her swimming suit but I have yet to find out if the girls sizes are included. At least Detamara and I can get some new summer pairs. 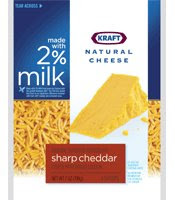 Kraft Cheese $1.00/1 ~ For Shredded, Chunk or Sliced Natural Cheeses. These will not last long. Oscar Mayer is giving away free hot dogs. 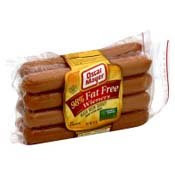 Register and get a coupon for a free pack of beef hot dogs in 4 to 6 weeks by mail. Carter’s up to 60% off Memorial Day Sale this weekend only - May 21st-25th. Plus, take an extra 30% off already reduced clearance merchandise. Get your $10 gift check for every $25 you spend May 21st-June 14th. Save an extra 20% off coupon if you are a Carters Email subscriber. Small prices, big savings! Shop today for babies and kids sizes newborn to 7. *See Store for details on how to redeem the $10 cards. 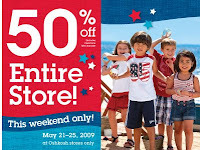 50% off Entire Store Memorial Day Sale at OshKosh B’gosh stores this weekend only - May 21st-25th. Get your $10 Play Card for every $25 you spend May 21st-June 14th. If you subscribe to the Oshkosh newsletter in the latest email is a coupon for an extra 20% off a $50.00 purchase. I surprised Kristy when I paid for her purchase at Carters, this Grandma got to buy the bringing home the baby Newborn pink lamb sleeper set and matching blanket and paid for three pairs of woven pants in pink, khaki, and white for Kasja. I never would have believed that we someday would be able to fly to visit our kids, much less pay for shopping purchases and still have money in the bank. I remember back when we had nothing. But what we did have was family. Here I am spending time with Kristy and miraculously a very grown up Becca. I am so very blessed. Kristy is now a new dedicated coupon clipper. 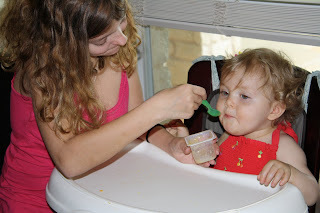 Becca helped with feeding Kasja. Kristy and I ran out for a ride to get a Sunday newspaper, or should I say multiple Sunday newspaper. I was in heaven as the Austin paper has great coupons for a frugal $1.60. 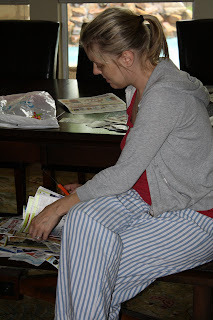 After naptime Kristy and I worked on couponing and matching up the ads while Becca helped with toddler care. Becca has anxiously awaited the May 5th release of the 4th Season of Jon and Kate Plus 8. With all the tabloid articles about one of her favorite shows, she is worried whether there will be a 5th season. Rumors are circulating that Jon and Kate will split. Who will get the kids? Maybe they need to retire and work on their family dynamics. There is nothing like getting to see the Kasja in person. 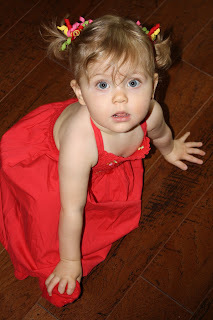 I played dress up with the new Gymboree dress I brought for her with socks last season. We stopped by the Gymboree Outlet and I found the matching barrettes for $1.99. Gymboree Outfit, socks, barrettes...$13.99! Who says shopping at Gymboree is expensive? PS...Isn't she cute, or is it just Grandma bragging? 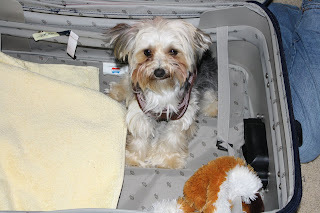 Morgan is used to riding her doggie case and she thinks she is ready to go. But I think Becca needs to pack clothes in her suitcase. She doesn't need to ride in the suitcase, she gets to fly coach for FREE. I just tried on my clothing for my trip to Texas and realized I am really short on clothing that fits. I now know why...I had packed away my shorts and tops and can't find them anywhere. I have only 1 pair of shorts and a pair of capris that I can find. I knew that I needed to go over to the Bargain Nook and see what Lands End items I can find for incredibly frugal prices! I live in SW Wisconsin and near the home of Lands End. Lands End is a generous company and supports persons with developmental disabilities with donating merchandise to several thrift stores run by the DD organizations. I ran out and found 2 plain short sleeve polo shirts, a sleeveless polo which I love, and three pairs of khaki and black capris which were on the sale. With using my 20% off coupon and combining it with my $10.00 free from filling my punch card, I have three complete outfits for under $5.00. These items are new, and I cannot find any visible flaws. Three pairs of Capris, Three Rugby Tops for $5.00 and with Lands End quality and styles they will last me for many years. Now that I bought some capris and tops, I can't find the swimsuits. They are packed away I had them when I was sorting for the resale and garage sale, I am hoping that they did not get given to charity by mistake. I am praying that we find them soon, losing a whole families swimsuits with our pool in the backyard would be a disaster. I had offered a reward for anyone finding the plastic comforter bag which contained the swimsuits...and I won the $2 prize. I found them in the laundry room closet next to the extra laundry detergent. Prayers were answered, now only if I can find my shorts. I just went through my buckets of clothing I have collected on end of the season clearance sales for little ones. I just discovered that Kasja grew much faster than we expected. I have more l8 months clothing than 24 months. Kasja is l4 months and into 24 months and 2Ts for the upcoming season. Fortunately for my miscalculation on which percentile this little one would be in will not be wasted as Kasja's little sister Mahala is due in July and will fit into the 18 month spring/summer stuff eventually. I have some clothing for her especially little sundresses and a couple of sunsuits but I am short shorts and tops. Kristy and I will just have to go shopping :) I am sure Kristy will not complain, but I may have to buy Grandpa an ITUNEs Card when I get home or maybe 2! I printed off the 30% off Gymboree in store coupon, my 20% off your next purchase of $40.00 or more from Oshkosh, and 20% off any purchase of $50.00 or more. I forwarded the coupons on to Kristy just in case I forget them at home. For those who do not know me well, I am a kids clothes junkie and expert kids shopper. When my older kids were small I worked for a very exclusive childrens clothing store chain in the Minneapolis area for years. With my discount and buying off season or buying mix and match of an entire grouping of clothing my kids were usually dressed well and color coordinated. (I say usually, as my Ian could mess up any outfit in the time we walked out the door to the time we put him into his car seat). This Grandma stuff and shopping for bargains is the best. This next weeks blog will be coming from Texas and I look forward to sharing the Children's wear bargains I find from Austin. I have done my research, there is a Carters and Gymboree right in Cedar Park within 4.5 miles of Kristy's and the Round Rock Outlet Center is 15.4 from Kristy's with not only Oshkosh, Carters, Gymboree, Children's Place, Ralph Lauren and almost anything we want. Becca is excited, she DOES NOT NEED anything, but she will try on stuff with her big sister anyway. Well I better go and see what I own that still fits for the summer weather in Texas. 50 has added 15 unwanted pounds. This oldest daughter of mine has been a "me do it myself" kid from the time she was only 7 months old. She has been self sufficient and way ahead of the learning curve, keeping me wondering how to parent this kid who is much smarter than I would ever be. Now that she is a MOM herself, I enjoy the strengthening of our relationship, this Mother/Daughter now a parent give and take of wisdom is an incredible blessing. We talk almost everyday, sometimes twice a day when something is not quite right, or the excitement of the first's of my granddaughter Kasja. Living a thousand miles away means that I don't get to see them more than once or twice a year and I have to watch them both from her blog and talk to them through the cellphone. I may go "a little overboard" when it comes to buying things or clothes for Kasja because I can't be there. I haven't seen them since December when I got the gift of living in the Hilton babysitting Kasja with the girls while Kristy and Chris were in the Twin Cities for 3M business. I got a urgent phone call from my oldest daughter Kristy who needs Mom. She was trying to handle everything, but her husband Chris is heading to Singapore for two weeks and she hurt her ribs and can't lift Kasja. Kasja is now 25 pounds at 14 months and with Kristy almost 29 weeks pregnant, she needs help. She can hardly breathe and does not sound good. Mom is the Calvary for so many others of the Yurcek tribe, sometimes I feel guilty that I can't help Kristy. Besides, I needed an excuse to go spoil that little granddaughter of mine and spend some quality time with Kristy before the new baby arrives. Doc got off work early and filled him in and he checked the bank account and said I have to go! He told me Kristy never needs help, she is so independent, that when we have an opportunity to be useful, we have to drop everything to be there for her. She had to grow up early at the age of 11 when Becca entered our lives. She was the little Mom for her siblings when I needed her to be. I need to be there for her. Now I can afford the tickets without budgeting because I have been saving so much money on everything while staying on the course to pay off debt and saving for our trip for Marissa's September wedding. Becca and I leave Friday for Austin, Texas for two weeks. Doc will tend the pets and with my friend Vickie's help with Detamara and the school schedule. I will have to pay $15 each suitcase, but Kristy discovered that furry little Morgan Service Companion Dog will fly FREE with proper documentation. Psychiatric service animals can be out for companionship during the flight and Miss Morgan won't even be banished to her case for the entire flight. Thank you Northwest Airlines for accommodating special flyers with FREE service animal flying saving $80 each way and they can't charge for little Morgan's suitcase! Now for the hard part, putting up with Becca's obsessing and can't wait until Friday hyperness. It will be a long week. Within minutes of getting off the phone, she was tearing apart her room rummaging for her clothes to pack her suitcase. I hope Friday comes fast or I need a set of earplugs. 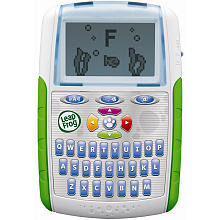 Text the keyword HORROR to 25866 for a chance to win 1 of 10 LeapFrog Text & Learn PDAs given out each day! No Purchase Necessary. Standard text messaging fees may apply. Legal residents of the 50 United States (DC), 18+ years. To enter w/o sending a text, or for Official Rules including odds, visit smsrules.com/leapfrog. Void where prohibited. I know there is controversy about whether we should expose our kids to texting. Check out this article. *I will have to get one for Miss Kasja. Maybe I will save her Mom from having her phone hit the toilet like I had when Dee was younger. Sorry Kristy, you will have to find coupons for inexpensive batteries because this Grandma loves to spoil Kasja with Leapfrog learning toys. All Aboard Toys has coupon codes to save on their already sale prices on all their toys Site Wide thru 5/15. They have many Toys on clearance and when combined with a coupon code will make many toys way below 50% off. They also have a big selection of Thomas the Train Toys and Melissa and Doug Products on their site and all are at least 20% off regular retail. All Aboard Toys offers $5.95 shipping. *When I have ordered from this company I have always had fast delivery. I was just reading the post from my frugal friend Candace at Dealectible Mommies about coupon dread and how to handle coupons and organization. This is one area I needed improvement when I got back into couponing. When I had just adopted the kids and 10 kids under l7 at home, with multiple teenagers, finding time for clipping and organizing coupons was a premium. Clipping the coupons was not the problem, getting them all put away was. For clipping I had help. The kids who were in "Trouble"their sentence; clip all Mom's Coupons. Yes, those days MOM equates to Mean Old Mom when someone was sentenced to coupon jail. There was always someone who was in trouble for mouthing off, hoarding something, got in trouble at school (if Mom got a phone call from school-negative misadventure, it was an automatic consequence) or just plain being obnoxious. The offending in trouble child had their choice clip Mom's coupons or pair the socks for a family of 13 or write a quota of sentences. Coupons was a easier choice. As the kids were doing better and less often in "trouble", there were those with Occupational Therapy Challenges, and "we practice using scissors and cutting on the lines". The only problem, don't turn your back because someone may cut their hair or someone elses and make a thorough accounting of the scissors or the Barbies all had new hair styles. 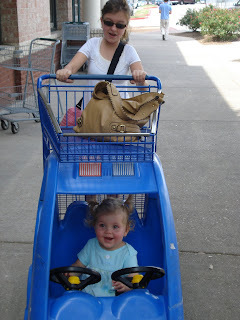 Sometimes when kids wanted something, or to go do something, I had willing helpers who VOLUNTEERED to cut coupons. I even had a couple of kids who swore that when they grew up they were NEVER going to cut or use coupons. Kristy, Marissa are all couponers, and Nathan married one. Ian shops at Mom's Superstore storage room along with DJ, Matt, Deangelo, and Shay with finds from this Mom's Coupon savings. I learned that some kids could do better than others in sorting out the older expired coupons. When I got behind, I felt guilty as I dumped the coupons into the trash and started over. For years I kept my coupons in two multiple plastic organizers and divided them into food products and then household and each was a different color making it easy to grab the right pouch. With our original family we were mostly on a gluten-free diet so what food coupons we could use would be limited, but we have always never paid much for paper products, personal care and household goods. Once we adopted the kids and every meal was divided into gluten free and wheat foods we started clipping and saving snack and wheat containing food products. When we were delivering papers for our livelihood while my husband was back in school and medical school, I had up to 40 loose coupon sections to come home with, we learned the art of stack cutting. I would only stack up to 10, tear them down the middle fold (if the middle has a coupon on both edges we pull it out. I staple the coupons I want together through the entire stack. That way the coupons do not shift and I have them together and neatly organized. To this day I still stack cut my coupons, it saves time cutting and organizing as all the coupons of the like kind are ready to be put away. When I want to use one or more it is easy to pull the staple. But most often when I need a coupon I am buying more than one anyway and just hand the cashier the coupons and they scan them as a packet one at a time. I had never had time to be so organized, but with just the girls at home, I had TOO MUCH time on my hands. I went to putting my coupons in baseball card pages in TWO BINDERS.One for FOOD and One for Household products with DIVIDERS. After stack cutting the like coupon sections I sort them into piles or a coupon pouch till I have time to put them into the binders. I fold them to fit and it only takes me an HOUR a week. But when I shop I have all my coupons where I can see them. I am saving so much money by toting my binders when I head to the store, the binder sits nicely on my purse in the baby seat when I need to check them while browsing the clearance racks. Both binders fit in the carrying bag I bought on Black Friday from Bath and Body Works. The bag is heavy but worth the weightlifting when I see my total from the cash register. For the first four months of using the binders, it may take me an hour a week to put them away, an hour to pull them at the end of the month. But the time and ease of finding a coupon when I need it is much less frustrating and time consuming. I have saved hundreds of dollars since I started using this system in January because I can easily place my hands on a coupon when I find a bargain price. I get the stares, with having my coupon tote and TWO binders. Almost everytime I have my binders out, someone comes up to me and says you are "Really Organized". I smile. It may have taken me 30 years to get that organized, but better late than ever. Organized--me? Mrs. ADHD/OCD...have I always had it, or did I catch it from my kids? My favorite thing is while standing in line, is to go into my coupon binder and pull out coupons to hand to the person in line with me and save them $$. My random acts of coupon gifts is just something I have always done, now with my binders it is much easier to bless someone. OK, I must admit, I usually get them organized each Sunday, but the last two weeks, I have been tearing my house apart cleaning, organizing and with being out with Becca hitting garage sales, I am two weeks behind. Yikes... I have way too many coupons to organize. I have learned my lesson, take my hour a week and get it done, or I will be lost in Coupon Confettti. Well I have got to go, I have two+ hours of coupons to catch up on, before I head to Target tomorrow night. Head on over to one of my frugal favorites Hip2Save and check out the Target Matchups to pick up some very inexpensive Kraft Products. I love the FREE Crystal Light, Nabisco 100 Calorie Packs, and $.09 Kraft Dressing--My Catalina is almost out. Instead of reposting all the deals, I am posting the link as with the Kraft Coupons combining them with the Target Coupons is just too good to pass up. The Thrifty Mama Site also has Target Matchups with links for the coupons. These deals are completely amazing and I can't wait to head to Target :) I just hope they don't sell out before I get there. I have to run out to pick up another print cartridge to print my second set of Kraft Coupons and we will be heading to Target tomorrow afternoon. Sign up for Kraft’s new online community and when you do you’ll have access to up to $50 in coupons from Kraft Foods. Just click on the “Coupons” tab and then “Click Here for Coupons” to have access to SIX pages of Kraft coupons. I went over and printed them, I can't believe that they had more Oscar Mayer Hot Dog Coupons which will combine with the Target OM Coupon. Becca is now stuck on eating OM Hot Dogs and can make them herself. *Use the $1.00 Kraft Barbeque Sauce coupon at Walmart ($.97) and get it for FREE. Remember you can print off two sets of coupons. Our Kmart has double coupons on ad up to $.75 and with Kmart Doubling Proctor and Gamble Coupons up to and including $2.00, buy $35.00 worth of P & G items--Mail in and Get a $10.00 Kmart Gift Card. Get $10.00 Gift Card, 2 Free Movie Tickets ($17.00) and 5 Shampoos for the Gift Bags for the Men in the Homeless Shelters and Tide for my Washer. Hy-Vee beginning today has Kimberly-Clark Products on Sale and with the Coupon from the Sales Flyer. Purchase any 2 participating Kimberly-Clark products * and $5.00 Hy-Vee Gift Card and get $5.00 off your shopping order. Huggies 56 to 96 ct. Big Packs $19.98, Viva Paper Towels 8 Big Pack $10.99, Cottonelle Reg. Ultra 24- $12.88, Scott Paper Towels 4 big roll or Tissue 12 Roll $7.88. Buy 2 and combine with coupons and the gift card is basically FREE. Pay $13.76 for the three items. 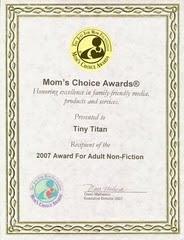 There were 12 entries for the Tiny Titan Book Giveaway and all those who entered will receive an autographed copy. Happy Mothers Day. 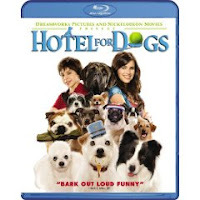 Becca's Movie Deals giveaway winner of the new release DVD, Hotel Dogs. Drumroll, please... the winner is Lauren S. The proud owner of 4 dogs. The winner will be notified by email and has 48 hours to respond. In one of my Coupon sections I found an Ad for Kmart announcing that this week 5/3 thru 5/9 if you buy $35.00 in Proctor and Gamble products you can mail in and get a $10.00 gift card. Kmart will also double all P and G coupons up to and including $2.00. (This I think means that even non-doubling stores will still double P and G coupons). The same rules apply for regular doubling, 4 of any one coupon, up to 75 coupons per day per customer. Kmart had a couple of P and G items on their ad and with doubling coupons it will be easy to spend $35.00 before coupons to score a $10.00 gift card. I will stock up on Tide which is on sale for $10.99 which is a good price and couple it with $1.00 doubled coupons makes it frugal good quality laundry soap for my HE washer and a rebate gift card to add to my savings. I will not be able to post more Kmart P and G scenarios until later tonight, I have been writing my keynote address for the Awards of Excellence TriState Banquet and I will be presenting tonight the story of Tiny Titan and the Life Lessons it taught us. Check back tomorrow for the Kmart P and G Coupon match-ups. This morning I woke and headed out to reading some of my favorite blogs. 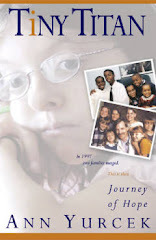 I have been following he story baby Kayleigh. This weekend, her parents are preparing to say good-bye to their precious daughter Kayleigh. At Kayleigh’s Story: One Pound Blessing, her Dad has shared since June, 2008, about Kayleigh, his tiny baby girl, born three months early. Now, instead of bringing their baby home with hopes and plans to watch her grow up, the Freemans are just hoping to bring their little girl home to say good bye to her. Please say prayers for the Freeman family as they bring their baby home to let her go. I remember my times in the NICU in vivid clarity, the moments etched permanently in my memories. I treasured each moment, I was assured that our Tiny Titan's moments would be short. I wanted memories of our time with our baby. We brought our Tiny Titan home to die, like so many others. Thosee were some of the toughest decisions I have ever had to make, DNR orders or fighting for our little ones life. Making plans for how to handle her passing, and how far we should go to save her life. What to do when. No parent should ever have to face such tough decisions, but I learned we someday will all have to make those decisions at life's end. We just had to do it sooner than others and learned how precious life is. Say prayers for Baby Kayleighs parents for peace in their decisions. The many times we thought she was ready to head out her NICU home to only be stopped by another crisis. We just wanted some time with her at home with family. The Freeman's are praying Kayleigh can come home. I remember bringing Becca home, with the nursing, the celebration of her siblings at long last being united with their tiny baby sister. Every morning they would head to her room which had been turned into a pediatric intensive care unit to say good morning and see if she was still here. With each days passing I would thank you God for another day with Becca. Say a prayer that Kayleigh can come home to be with her family. God allowed us to bring our Becca home, and those mornings have turned into years. Gods blessing he has kept her here with us for now. So many tiny little ones have gone home, but for today not my daughter. With each tiny passing another moment of wondering when is it was my turn. Sometimes I feel guilty that my daughter has lived and so many friends have had to say goodbye to their tiny angels. My heart is heavy for baby Kayleigh's Mom and Dad, I understand their pain, but blessed by their sharing their journey with their story. I sit here in tears, listening to I will praise you in the storm from Kayleigh's blog. I praise God for all the moments he has blessed us with our Tiny Titan. Our story should have had a different ending, miracles happen but sometimes God spares our kids pain and brings them home. One of my most important lesson I have learned that God sends us Tiny Teachers who come to bless us with gifts from above. The greatest lesson my tiny teacher has taught me; to trust in God, to believe in miracles and To Love Well Today. 10 Things You Were Dying to Know - I've Been Tagged! 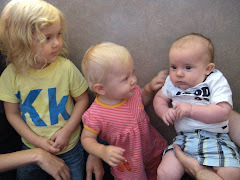 I have been tagged by Candace at "Deal"ectible Mommies. I got this yesterday and finally have the time to write because Becca had me out all day. I had better get this done before I have to write my Keynote Address for the Excellence in Education Banquet for the Tri-State Grads who are at the Top of their Classes in the 29 School Districts in our area for Tomorrow. Going to Garage Sales with my short sidekick Becca, who is currently obsessed to not be at home and won't let me stop until we had hit all 106 sales. She was checking them off of the citywide map. Trying not to bite my fingernails before having to present the keynote address. 2) Which item of clothing do you wear most often? Now that we left the City for the country, a hooded sweatshirt and a pair of yoga pants. Tomorrow I get to wear Author-Doctors Wife Clothes that hang in the back of my closet. I will have to ask Doc what is for dinner as he is the one who is cooking tonight. I would rather do housework than cook dinner. With my having Celiac Disease and several of my kids, we cannot cheat and throw in a pizza or eat some ready-made meal. We have had to cook from scratch for almost every meal for almost 29 years. I have found my favorite radio station which happens to come from Michigan here in our tiny community, Family Christian Radio. I also listen and play name the band with Doc with his obsession to music on the oldies station while in the car. I have to enjoy Doc current obsession, Irish Punk and Celtic music whenever we are in the car and not playing name that band. FYI: It is a good thing I am not graded on naming the band, I usually need a hint. Candace--has an amazing blog where you can find reviews and deals on many good quality childrens products. 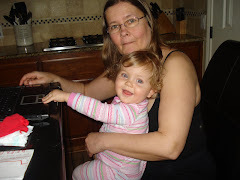 She has helped me keep my granddaughter Kasja in shoes with her shoe posts. Kasja is definitely a Yurcek family member as most of my kids have shoe addictions. I have two: Heading to California to visit my daughter Marissa, shoe shopping on Melrose Avenue and visiting Doc's sister Carol who lives near the beach in San Diego. The other heading to Austin, Texas to visit my other daughter Kristy, her husband Chris and my granddaughter Kasja. The Lancaster County Brides Series by Wanda Brunstettler. The series is about Amish Women and their lives. I have become interest in the Amish as I live side by side with them and have to watch when I drive the county roads to watch for buggies. I loved watching to see what they bought from all the garage sales this weekend in Lancaster. 8) Four words to describe yourself? Stealing away to our backyard pool listening to music, floating on the raft without kids! Leaving Doc with an obsessed Becca or with the kids when they were at home and running away to McDonalds for a Diet Coke and a Hot Fudge Sunday and then read a book in the parking lot. 10) First Spring thing to do? Wash my sheets and my Comforter and Bedspread and hang them out of my clothesline to bring the smells of spring indoors. Want to know what coupons are going to be in many Sunday papers tomorrow? I have found a resource for you. It looks like many papers will have 3 Coupon Sections.